The current condition of the North Caicos and Middle Caicos causeway. The North Caicos and Middle Caicos Causeway (2017). The North Caicos and Middle Caicos survived Hurricane Irma and Hurricane Maria with essentially no damage. 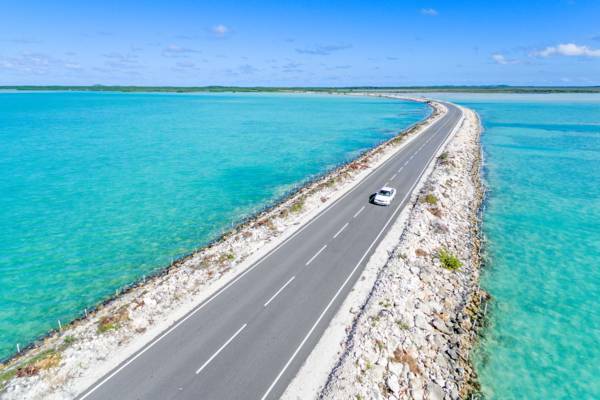 Located in the shallow south-eastern end of Bottle Creek Lagoon, The North and Middle Caicos Causeway is a one mile (1.6 km) long limestone quarry fill embankment roadway connecting North Caicos to Middle Caicos. Two small concrete bridges and many corrugated HDPE pipe culverts allow for natural tidal movement. The Causeway is currently in excellent condition. Repairs have been made to the serious hurricane damage that occurred during Hurricane Ike and Hurricane Hanna in 2008 and the causeway is now completely repaved and safe for any vehicle traffic. Two full lanes are maintained for the entire distance. Care should still be taken when driving on the surrounding roads as potholes and rough transitions between unpaved sections and asphalt still exist in the general area. The condition of the causeway in 2010 before repairs. 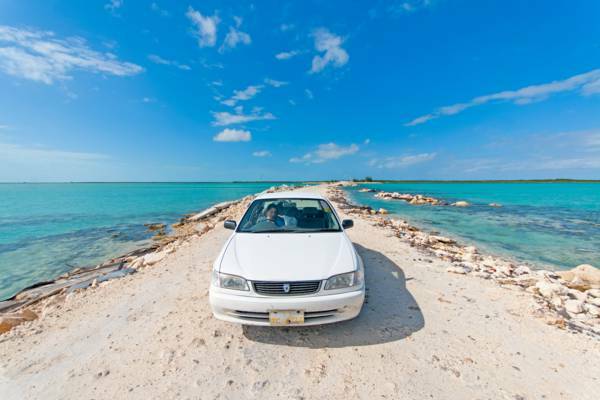 Before the construction of the causeway in 2007, the only link between North Caicos and Middle Caicos was by small boat. Needless to say, this wasn’t acceptable for two large islands separated only by a shallow channel. Initially when completed, the causeway was paved with asphalt, had concrete side walls and full street lighting. However, these features proved to be short lived as Hurricane Hanna passed twice over the Turks and Caicos over a matter of days and caused extensive damage to the causeway. Nearly all of the asphalt paving was washed off in sheets, the concrete barriers collapsed, and much of the street lighting and utilities simply disappeared. Large amounts of rebar was exposed, as was the ground barrier sheeting. The bulk of the rock and crushed limestone embankment remained, however the width at high tide barely allowed for a vehicle to pass. The condition persisted with only minor repairs until 2014 when a major refurbishment project began. A second stage of repairs is ongoing (2015) and expects to return the causeway to its initial polished state.